The social dynamics of innovation networks captures the important role of trust, social capital, institutions and norms and values in the creation of knowledge in innovation networks. 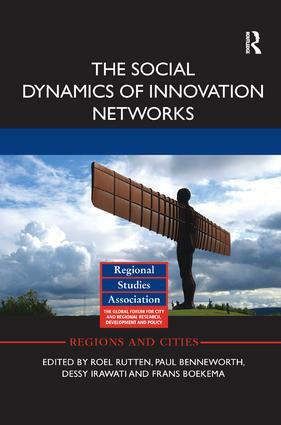 In doing so, this book connects to a long-standing debate on the socio-spatial context of innovation in economic geography, which is usually referred to as the Territorial Models of Innovation (TIMs) literature. This present volume breaks with the TIM literature in several important ways. In the first place, this book emphasizes the role of individual agency because individuals and their networks are increasingly recognized as the principal agents of knowledge creation. Secondly, this volume looks at space as a continuous field of opportunity rather than as bounded territory with a set of endowments, such as knowledge base and social capital. Although individually these elements are not new to the TIM literature, it has thus far failed to grasp their critical implication for studying the social dynamics of innovation networks. The approach to the socio-spatial context of innovation in this volume is summarized as Knowledge Economy 2.0. It emphasizes that human creativity is now the main source of economic value and that human creativity and knowledge creation is not an organized process within organizations, but happens bottom up in formal and informal professional and social networks of individuals that cut across multiple organizations. Roel Rutten is Assistant Professor at Tilburg University, The Netherlands. Paul Benneworth is Senior Researcher at Center for Higher Education Policy Studies, The Netherlands. Dessy Irawati is Managing Director at EduPrime. Frans Boekema is Full Professor at Nijmegen University, The Netherlands.